Ummmm - How long do we have to do all the challenges??? 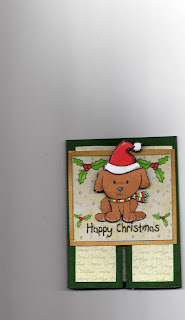 Hear is my no 2 challenge this cute dog was decoupaged the card looks flat because i have had to scan it as i do not have a camera yet. Last edited by crafty val on Sun Nov 09, 2008 6:50 pm, edited 2 times in total. Last edited by crafty val on Sun Nov 09, 2008 6:54 pm, edited 1 time in total. H - I AM SO VERY sorry I am so late do you need a note from me mum?? Sue, that is fabby - love the snowman, he is so cute! Great Alba, 10 points for you.